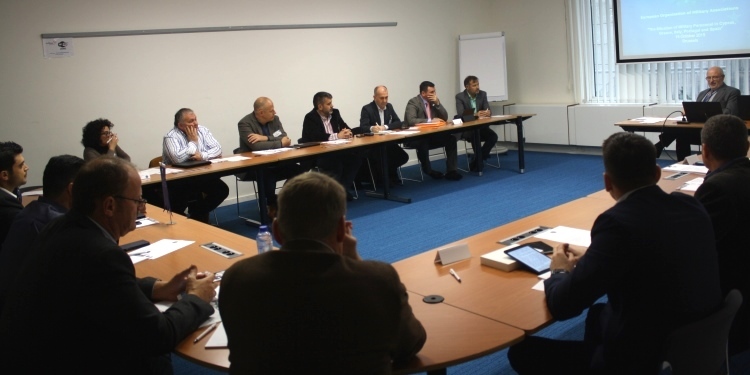 On 15 October 2015, EUROMIL organised a meeting on the situation of military personnel in Southern Europe, more particularly in Cyprus, Greece, Italy, Portugal and Spain, before its Presidium Meeting which took place on 16-17 October 2015 in Brussels. The President opened the meeting by welcoming participants and presenting international standards and best practices related to fundamental rights and freedoms of military personnel. Please click here to view his presentation. Unfortunately, among all MEPs and national representatives from the countries listed above who are based in Brussels and had been invited to the event, only one Portuguese MEP attended the meeting. The lack of interest of higher officials for this meeting demonstrated the lack of recognition of military personnel rights and fundamental freedoms in Southern Europe. Despite the existence of international standards, especially at European level, it was highlighted that representatives of governments and military leaderships of these countries still lack willingness to implement such legislation and change their mindset. Together with its member associations, EUROMIL will continue lobbying these relevant authorities.